The South East used to be known as the 'garden of England' and rightly so. With a mix of quaint seaside towns and rural country villages, there's a good variety of walking routes to choose from. I grew up in Kent and have spent most of my life living in the South East, so would call myself a true Southerner. I've put together a list of my favourite places to go walking, including short walks and longer hikes. You can either start on Dover seafront and climb up a flight of stairs around the side of the docks, or you can be a little lazier and drive up to the National Trust car park past the castle to start from there. I'd recommend the extra climb from the seafront to get the epic view of Dover Castle and the port. If you have a whole day, Dover Castle is amazing and has some creepy tunnels in the white cliffs themselves. I try and take everyone to Dover Castle because it's one of the best in the UK and has been beautifully renovated (I know I'm biased, but it really is great!). The White Cliffs of Dover are iconic. They're the first thing you see as you arrive on the boat from France or Belgium, but not many people seem to stop and walk over them. St Margaret's Bay is 4 miles along the cliffs from Dover and was home to Ian Flemming, who wrote the James Bond novels. It's a cute little bay with caves and rock pools. Just be careful not to get stranded out in a cave when the tide comes in! I've walked this route many times, in many weather conditions. The chalky ground is not an ideal surface in the rain because it gets very slippery and cliff walks are not advisable in high winds. You don't want to be blown off! The best time to go is on a sunny day with no wind, maybe in Spring or Autumn when there are fewer people around. Start your walk from Joss Bay and walk round to the North East. As you turn the corner you will notice an arch way in the cliffs. When the tide is out you can walk through the archway to Kingsgate Bay and Botany Bay. I'd argue that this is the most picturesque beach in Kent and it's definitely my favourite. Chris has attempted climbing the cliffs at Botany Bay, but our bouldering skills are still very limited, so he's only managed to get a few feet off the ground. I'm not sure chalky cliffs are the safest climbing walls due to their crumbly nature, but at least the beach is made of sand rather than stones. Once you've finished in the bay, you can walk up the track to the road where you'll find a lovely pub aptly named the Botany Bay. Dogs are welcome inside but it gets very busy, so book ahead if you want food. I've chosen this walk, not because it's particularly scenic, but because of the awesome waves you can witness on a stormy day. Make sure you go at high tide so you can watch the waves battering the cliffs. Trying to run along the beach dodging waves is quite fun, but be careful because they're extremely powerful. Once you're soaked and tired you can head into Folkestone where there's a fish market in the harbour on Saturdays and plenty of pubs. Bishopsbourne is a tiny village between Canterbury and Dover. The hike starts through a church graveyard and heads out over pastures, parks and farmland before looping back to the church. The public footpaths take you through orchards and past oast houses, most of which have now been converted into homes. We hiked this in Winter when the orchards were bare, but in Summer you could expect to see thousands of apples. The route was suitable for dog walking and we were able to let Bella run along without her lead for most of the way, but there's an occasional sheep, cow or horse in the fields, so keep an eye out for animals and put your dog on their lead when the field is in use. The Devil's Kneading Trough is situated in the Wye National Nature Reserve and is an Area of Outstanding Natural Beauty. It's basically a deep valley that you can walk around and look down into. There are amazing views from the top of the hill which reach right out to the coast. On a clear day, you can see for miles and you can just about make out the nuclear power plant in the distance. The paths are well marked and maintained, mainly passing through grasslands. If you're into bird watching, this is a good walk to come armed with your binoculars because there are around 50 species of birds in the area. Dogs are welcome to roam off their leads, but again, watch out for sheep. We walked this route in Autumn 2017 and completed a 5-mile loop starting and ending in the village of Wye, but if you want a shorter route there's a free car park at the top of Devil's Kneading Trough. More information can be found on the Kent Downs Website. I spent a lot of time in Canterbury as a child, teenager and young adult, hanging out in the ruins of the castle, eating fish and chips, browsing the shops and wandering around aimlessly. Yet I still love going back and have never tired of the place. Canterbury is a small city steeped in history and culture, and is well worth a visit. Home to one of the best-known cathedrals in England, Canterbury Cathedral, many people come to Canterbury on pilgrimage from all over the world. You don't have to be religious to appreciate the immensity of the cathedral though, the architecture is fantastic. There are also lots of pretty parks around the city, which follow the river through the city centre. I'd highly recommend walking through the parks around the back of all the old townhouses. You can still see the dunking stall over the river that witches used to be strapped to many years ago, and part of the city walls are still accessible to walk over. I've recommended this walk because of the sheer expanse of wild open land that it covers. Apparently, the largest area of shingle in Europe, Dungeness looks like an area from a science fiction film. People live in tiny houses and static caravans on the beach, with little gardens marked by cute white fences, and there are several lighthouses along the coast to warm boats of the rocks. There is very limited shelter from storms, so warm clothing is a must if visiting the area in colder months. The main noticeable feature at Dungeness is the nuclear power station, which pumps out waste into the sea and warms the water, attracting birds and other wildlife. This has created scientific interest in the area and has created a wildlife sanctuary for birds. It's also a great place for dog walking because dogs can run for miles off-lead. Dungeness is connected to Romney Marsh by the Romney, Hythe and Dymchurch Railway, which is considered one of Kent's top tourist attractions. This walk starts in the stunning grounds of Ightham Mote, a manor house and grounds that have been renovated by various families over the last few decades before being sold to the National Trust. If you enjoy nosing around old houses, it's worth a visit and the staff are very friendly and informative. There is a circular walk from the gardens, through woodlands and neighbouring estates, or the gardens are pretty to walk around if you'd prefer a shorter route. Once you've finished walking, the cafe sells some amazing cakes to help you get your energy back. The National Trust website has a map of the walking route, which you can find here. 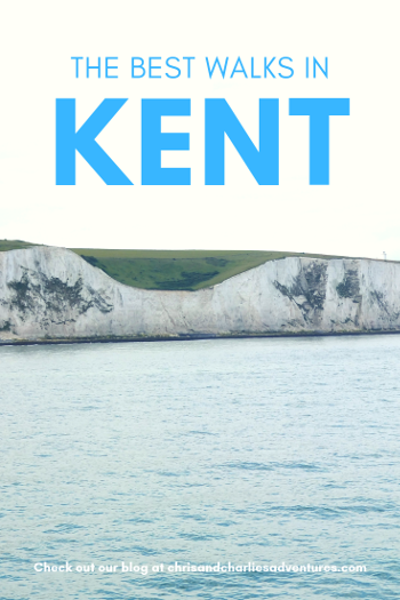 We hope you like our recommended walks in Kent. Please comment and share using the buttons below!